The University of Chicago Celiac Disease Center's mission is to cure celiac disease. As we focus on research toward a cure, we also strive to raise awareness and diagnosis rates through education and advocacy. Celiac disease is an autoimmune disorder, which means the body "attacks itself", rather than attacking a foreign substance as in an allergy. The medical treatment for celiac disease consists of strict adherence to a gluten-free diet. 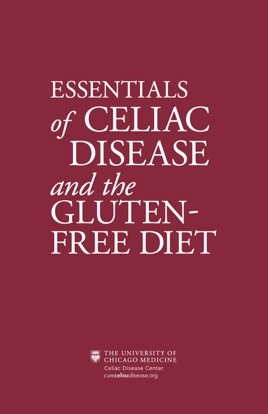 With this guide you will learn the basics of celiac disease: signs and symptoms, genetic and antibody testing, diagnosis and required follow-up testing. You will learn what gluten is, where gluten is found and how to avoid it. It will help you make healthy food choices while grocery shopping and preparing foods inside your home to manage your gluten-free diet. You will be able to identify gluten free grains, meal options and snacks for safe eating anytime. You will learn how to eat gluten free outside your home at social gatherings, restaurants and while traveling. You will also discover the pioneering research initiatives, programs and services offered by the University of Chicago Celiac Disease Center.